I stumbled out of bed this morning barely alive from night two of very minimal sleep (our boys are sick AGAIN, it’s too sad to even talk about-they are getting better though and that’s what’s important). On my way to brush my teeth, I tripped over the scale with my eyes half open and decided just to stand on it and see if it wanted to be my friend today. It thought about it for a second, and there it was….the number I haven’t seen in over 4 years. My pre-Shane, pre-Nathan, my “If only I could ever get there again” weight was staring me right in the face. My goal weight!! I got off the scale then back on because I didn’t believe it. 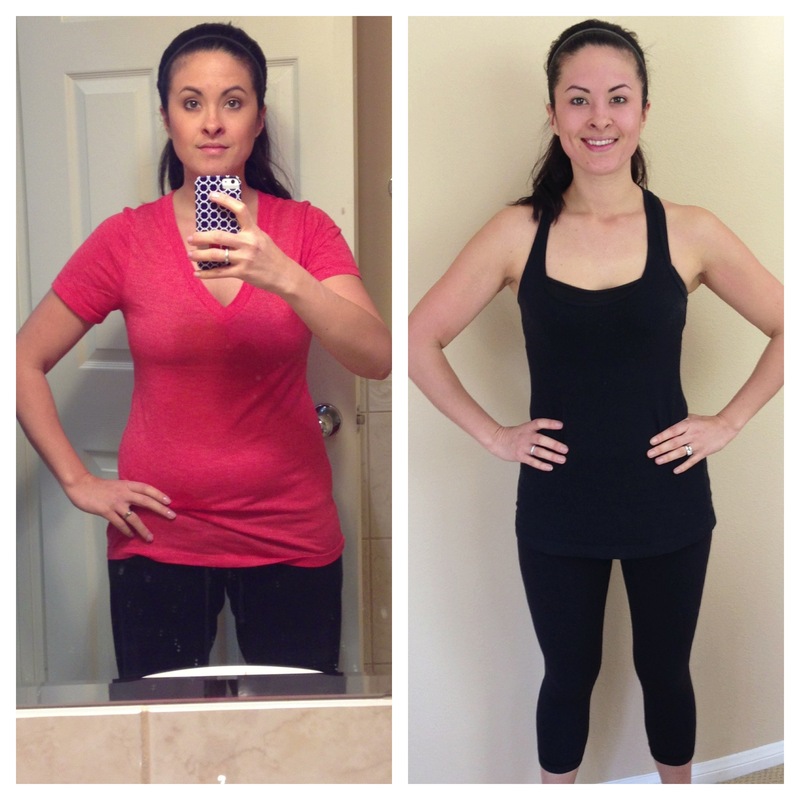 It was true….I have lost 20 lbs in 2 months! If I could kiss my friend Jenny I would! She put herself out there and shared her success with the Advocare 24 Day Challenge, and really inspired me! I still don’t know how it happened so quickly, and I honestly can’t believe how simple it has become since I first started. We eat more, we eat more often, but we just eat better….way better. I do exercise daily, or at least as often as the boys will let me. This ends up being a broken up 35-45 minutes on the elliptical machine each morning, a long run on the weekend, and I try to get to the gym for 1-2 classes a week. I think that’s what I have loved most about Advocare. It’s not only for weight loss, it’s a fitness program. Just 2 months ago I could only run for maybe half a mile before I would have to stop and walk for a few minutes. Today I ran just under 4 miles without stopping once. I have never ran this far in my life, not to mention I actually enjoy it now. I would love for long distance running to be my new goal since I no longer wish to lose anymore weight….I just want to be active, and stay active. My friend Liz is a busy working mom of 2 girls Nathan and Shane’s age and has totally inspired me with her running journey. Despite her busy schedule she finds time to run at least 5 miles a day even if she has to do it at 5:00am. She wasn’t a runner to start either and now she’s on her way to doing a marathon! Thanks to her I signed up for my first 5k in May, then have a 10k in June and maybe it would be “fun” to try a half-marathon someday. For now, baby steps! It’s so hard to find time as a mom to take care of yourself. My boys are my priority around the clock, and most days I feel like they are the ones calling the shots (for example Shane is on his fourth wakeup since I have sat down to type this…grrr). So many people say that being a mom is a balancing act, but let’s face it…my life scale is WAY tipped completely in their favor. I’m an all or nothing kind of person when I am passionate about something, and nothing tops the passion I have of being a good mom for these boys. This can be seen as a good thing, but it has also consumed me. I needed to get back to ME a little bit more. I find time for exercise now, I make time to prepare good meals for myself throughout the day and make sure I get to eat them when I actually want to (instead of a 3:00 pm lunch consisting of finishing their half eaten sandwiches). I think that’s why this challenge helped me so much…it put me on a schedule, and it forced me to plan ahead better, and to be honest…it was finally something to do that was just for me! The same is true of this blog. I had a family blog for awhile but then I realized all I was doing was spending every waking minute with my kids and then sitting to down write about every single thing I did with my kids. Obviously they will still be the highlight of what I write about here, but I want a place to journal things I enjoy doing in addition to being their mom. A place to share things that keep me creative, and keep me feeling like I still have some of my own interests. Thanks for letting me share my progress with you! It held me accountable this far just by writing about it, and I’m so happy to have taken some control of my own health and well-being again. I just turned 33 last week and I’m ready for this to be a great year filled with healthy changes for me and my family! You look amazing Lauren. Congrats on your success and reaching your goal weight! Thank you SO much Jenny, I’ve actually ENJOYED doing this! Couldn’t have asked for a better recommendation!! Lauren, much cheers to your success! I am interested in this challenge. I would love to lose 10 pounds. Do you know if this product is safe for woman trying to conceive or those who just conceived? We are trying to conceive…and I am concerned that I will have stop this challenge half way through if we get good news. Thank you! Hi Gina, what an exciting time for you! The 24 day challenge should definitely be stopped once pregnant, but all the days leading up to getting there it would be great! Starting off fit and healthy before getting pregnant is an awesome idea! If you found out you were pregnant I would just stop the supplements but still enjoy the healthy way the challenge teaches you to eat! Good luck to you!! Lauren, thank you for writing back. If I go ahead and purchse the kit, I plan to get it through you. Will you be able to give me some pointers on how to be successful with the challenge? Of course!! I would actually receive your email address and contact you right after. I have a timeline of when to take everything, a progress tracking sheet and also have a food suggestion list and recipes I love. You can also contact me anytime you have a question of course. It’s surprisingly simple once you start and will naturally turn into a lifestyle change. Feel free to email me via my contact form if you would like to talk through email before you decide to start! I just wanted to let you know I have not been receiving e-mails via my contact form. If for some reason you reached out to me and I didn’t respond please e-mail me at heylaurenrene@gmail.com. Thank you! It’s Sylvia from IG. Wow, wow, wow! You look amazing and fabulous! I was so inspired by your first before and after picture, I bought Advocare through Amazon with my credit that I had leftover. YAY! The bad thing about that is I have no coach or sponsor that helps me out. I’ve been googling, but I wish there was a detailed step by step plan. Everything seems pretty general. Do you know of any? Any help would be appreciated. Aww thank you SO much Sylvia I really appreciate it! I am so excited you have decided to do the challenge too! You know, I made the mistake of not buying through a distributor either and wish I had known. Please e-mail me through my contact form. I will be happy to help you through it and e-mail you some information that is very helpful. Instructions, tips, food ideas, recipes etc. I love the product so much I would love to help you use it best!! SO impressive! You look GREAT! I am sold! I never get out of the house that much that just the type of country it is here but I need to know what would be good exercises for me to do around the house. My body is pretty much just like yours ( I am our before now and I used to be the after). I am willing to do more and cut things out to loose this weight. And is that package the only thing I need to buy? I want to get the things I absolutely need to loose this. Thanks so much mama, you know how much I appreciate it!! Hi, I just ordered the 24 day challenge through your link. I’m excited yet very nervous. I hope I can lose 10 lbs too. I need to lose at least 20 lbs badly! If you have any helpful tips, please email me. I would really appreciate it! Janet congrats on committing to the challenge too! You are going to do great! I have your e-mail address and will send you some helpful information/tips now. If you need anything along the way let me know. Excited to hear about your results! Thanks so much!! Haha yes that is definitely the tough part Alena (cheese&cream food), you’re going to do so great though excited to see the results you get on your plan! I will definitely be posting more recipe ideas here!